Featured today is a natural and organic Italian Red Coral. 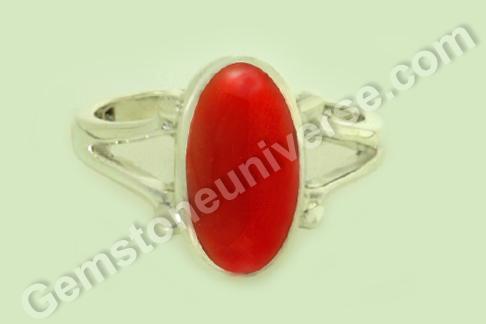 The treatment free red coral of 4.27 carats has been set in sterling silver as a Mars talisman ring. The red coral is smooth, blemish free and has a rich Mediterranean ox blood color. Coral is a gem of Organic origin, opaque and therefore is fashioned as a cabochon for the finest finish and look. Natural Red coral or pravaal/ moonga gemstone is the gem of Mars/ Mangal/ Chevvai/ Kuja/ Angaraka as he is severally known. 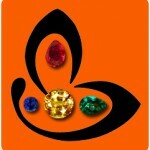 Moonga Rashi Ratna is the birthstone for the rashis/ signs of Aries (Mesha) and Scorpio (Vrischika). A well-placed Mars in an individuals birth chart can help one in achieveing the most difficult of feats in life. A talisman made of natural and organic red coral can help harness the energies of this planet. Natural Red coral has been a favourite with the ancients, be it any civilization, for adornment as well as for healing and protective amulets. The knowledge of metaphysical properties of red coral can be traced quite far back in time. This might just give a clue as to why many Renaissance paintings have cherubs as infants who wear necklaces made of beads and a sprig of coral. In Christian symbolism, the coral represented the blood of Christ, His passion and resurrection, and therefore its dual nature, human and divine. 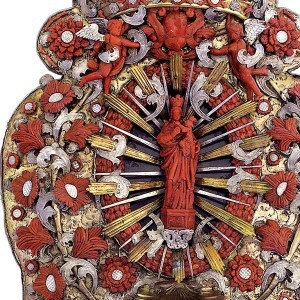 It is often found nestled in reliquaries and paintings of religious subjects that date back to five or six centuries. The Romans were the first to practice the technique of engraving, a rather tedious task. 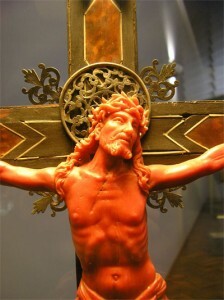 They focused more on making coral olives and grains, called “paternoster” used for the production of rosaries. If you are a natural Red Coral aficionado, there is a treasure house – a real treat that awaits you at the Conte Agostino Pepoli Regional Museum, in Italy where Red art of Trapani’s “mastri curaddari” is celebrated. 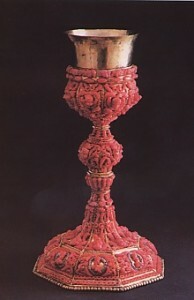 The creators of this art remained largely anonymous, but were adept in their skill as they brought out the best in coral by using alabaster, shells and mother of pearl. The works of Coral include nativity scenes, cultural artifacts and a crucifix by Brother Matthew (Matteo) Trapani Bavera carved from a single block of coral. 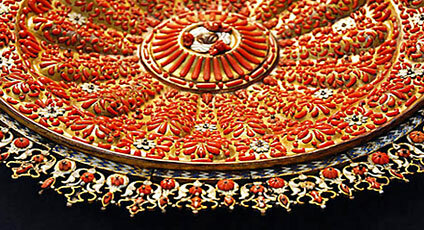 The master craftsmen here used the technique of ‘retroincastro’ where coral were used in several shapes on wood or metal to form stunning pieces.